← let go of high school already! this was taken last sunday when i decided to suprise harry after his shift (at 9:00 AM) for breakfast at one of the retaurants in I.T. Park. decided to bring along snickers so he won’t grow up ignorant from the world since he’s mostly couped up in the room. he can’t go out because our old dog is so mean and possessive of our attention (especially my dad’s) that we’re afraid she’d attack him. being a sunday morning, the park was serene, perfect for just hanging out and chilling. i sat by the pond for a while and enjoyed being alone for a few minutes. those are one of my favorite moments — when i can just be alone and be allowed to think. so this weekend, harry and i watched one of the local movies ‘miss you like crazy‘… i’ve always loved the tandem of john lloyd cruz and bea alonzo on-screen (don’t like her too much anywhere else..haha!) the movie was predictable but still interesting. i loved the concept. i loved the scenes. i love the conversations and the lines. and it brought about certain emotions that i’ve suppressed for a while. i miss my best friend so damn much. it’s harder breaking up with a friend than with a boyfriend. you’d take years of friendship and just throw it away. she was my soulmate. we could be together and not say anything but know how we are feeling. we had a falling out almost 3 years ago and my heart is still aching, everyday. although i have harry, there are times when i’d feel so damn alone because i lost the only person who can understand me without asking why. i have tried opening up to my other friends but it’s just different. she’s in hawaii and i’m here. miles apart and we can’t bridge this gap that we have. so now i have woken up with very swollen eyes, having cried myself to sleep last night. 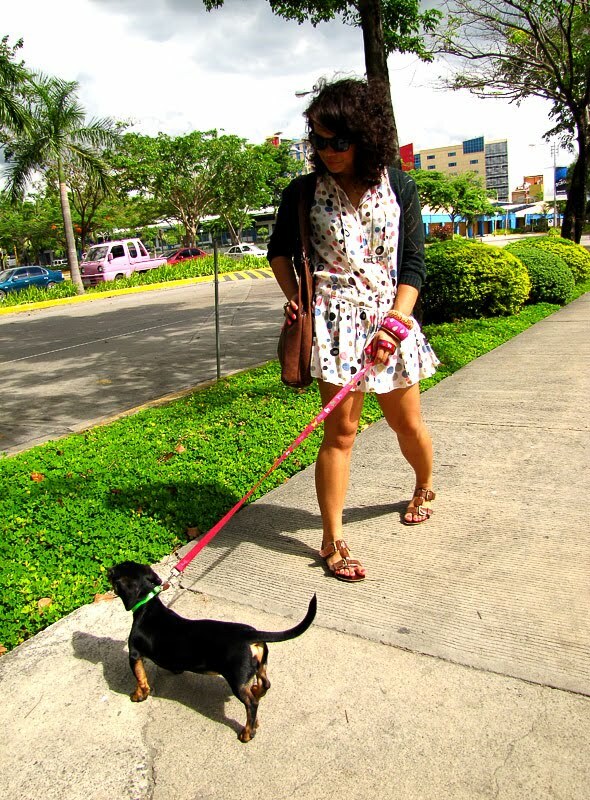 love the polka dot dress and your doggie is soooo cute! in looooove with your sunglasses! how do you always manage to look so cute in your pictures? i'm in love with those polka-dots. cute dog ! 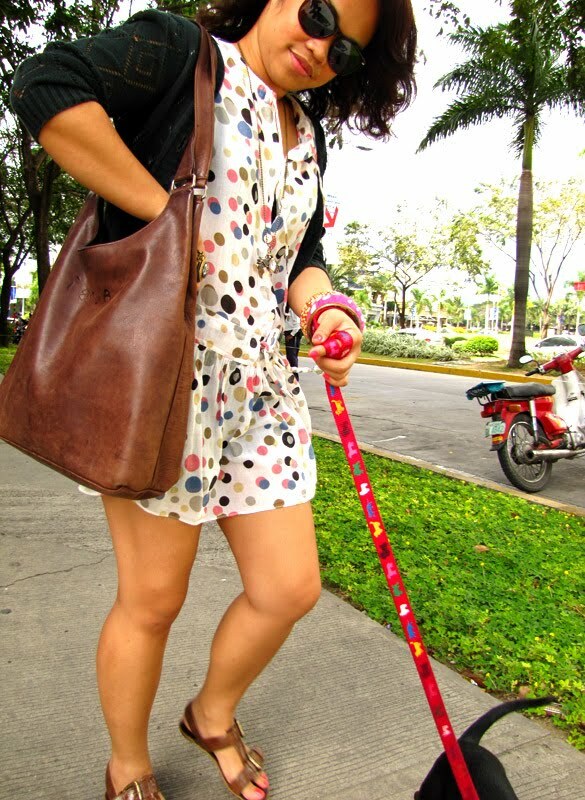 really love your polka dress ! and your sandals are fantastic ! adorable polka dot dress! you have the cutest dresses! i'm sorry to hear that you have lost your best friend.. it is so distracting!! hoping you get well soon and realize that you other friends are worth trusting and relying on! you look so lovely! i like the dress very much – it's so optimistic! you look very cute with the dots! sorry to hear about the 'break up' with your best friend, I'm not sure if time heals all wounds. Let's just hope it does! Love the polka dots dress!!! Dress is so cute, love the polka dots. G! 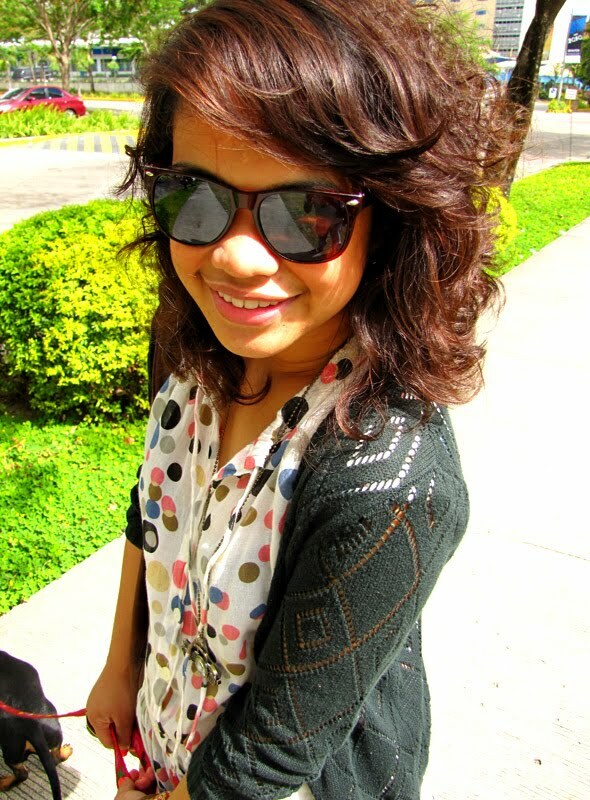 summer na summer ha:) gotta love:) may gani maka cardigan paka! init kaayo. mabuang ko. as in i want to go out in my underwear na jud. hehe. bitaw lets discuss that blogger meet up soon! lets invite, isabeau, dredreveries, kinsa pa uban? watchuthink? Dear dedicated followers of fashion, please enjoy the latest clip from the fashion reality TV series, Serg Riva: The Urge to Serg. Gorgeous! Love the polka dotted dress. Can't believe you thrifted it! That's so sad to hear. Could you build bridges, even if you are far apart? Nothing is worth losing a friend over. If it cheers you up, you look wonderful today. So sunkissed and happy. I am sorry to hear that. Hope you feel better soon. before i even scrolled down i knew that dress would be thrifted because you always find the cutest things. i love polka dots on you, way too cute. esp your dog ! Cutest little dress ever! Makes me want to eat many different colored scoops of ice cream, mmm. Is that the intent of your blog, huuuh? 'Cause it works. :D! Oh, don't cry! You are so lovely, there are new friends around the corner. And I'm sure you can find a way to communicate with your BFF, no matter where she is. I love your blog and your outfit is adorable! I'm definitely becoming a follower! Follow/visit my blog!!! Aw, about your friend, that's happened to me before. It's amazing how you can be so close with someone and then suddenly, it's like you're strangers. you and your dog are adorable! love you in polka dots! aw you and your pup are adorable! Super fresh and amazing dress love. Did you receive the details regarding the giveaway you won? See you soon in Cebu. I love those polka dots! You are so right, Gizelle … breaking up with a friend is the worse heartbreak there is! Hope your heart is healing … hugs! you look adorable and you shout out spring/summer with your outfit 🙂 i love it..
Beautiful outfit! I love the polka dots 😉 Awww that little puppy is so silly/cute!!!! I wanna give him a big old kiss! Aww I am so sorry you miss your best friend 😦 I totally understand how you feel, my BF lives in California, I am in NY….Waaa!! thanks for commenting! kimchi blue is great – you should check out some of their stuff on the UO website! wow love that dress, and can I have your dog? lol jk. hi i'm a new visitor!! omg that dress is so freaking darling! love it! gizelle! u have all these gorgeous polka dot pieces! this one's candylicious! !